Another Good Reason to Visit the 50th State! What’s a fruit that’s really good when completely unripe, fantastic when nurtured to juicy-soft perfection, and not really worth the trouble in between? The beautiful papaya! It is hard to beat the flavor and texture of a tree ripened papaya, particularly if you’re eating it not so far from the tree where it grew on Hawaii’s Big Island. They’re not easy to come by in most parts of the United States in this gorgeous condition, and, when they do, they’re the basic papaya, really good, but not like you get in places like Hawaii. Strawberry papayas sat next to regular ones in the Hilo, Hawaii, Farmers’ Market on a foggy January morning. They looked pretty much the same. But, myMEGusta had one of the strawberry variety for breakfast the next day at the Kilauea Lodge in Volcano Village. Adorned simply with a wedge of lime, it was heaven on a plate. The next day, she eschewed the additional menus items offered in addition to the fruit course, and her plea for “just more papaya, please” was answered. Who knows if the dead ripe “regular” papayas would have been just as delicious, or maybe even better if tasted side by side? But who wants to eat unripe, green papaya? We do! Shredded green papaya is the base for a Thai salad which also incorporates lime juice, hot peppers sauce, sweet pepper slices and peanuts all on a bed of lettuce. The cook always asks how hot, and myMEGusta’s request for super hot usually gets honored (sometimes, we are not believed…. ), another celestial delight. 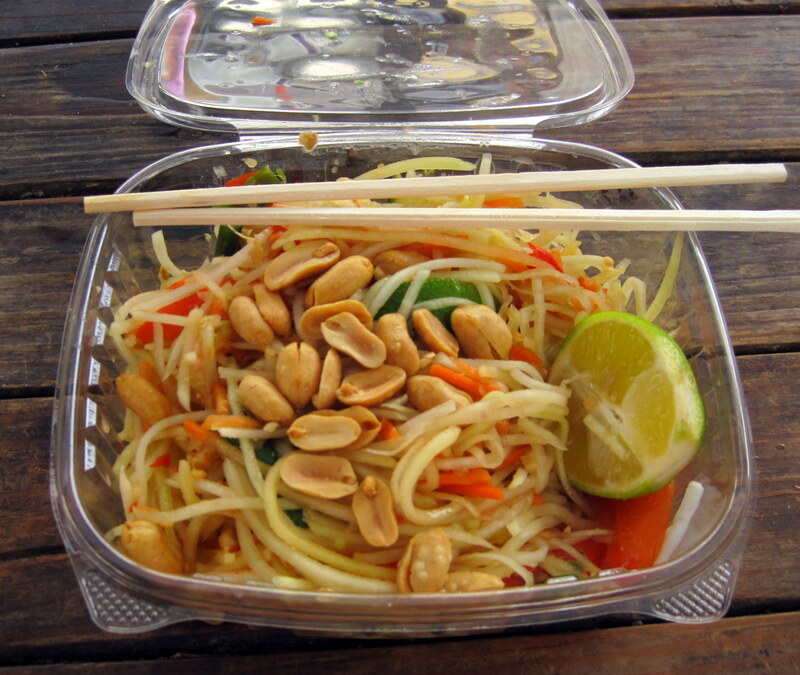 Available in most Thai restaurants, the green papaya salad has become a mainstay in mainland USA, which is great. 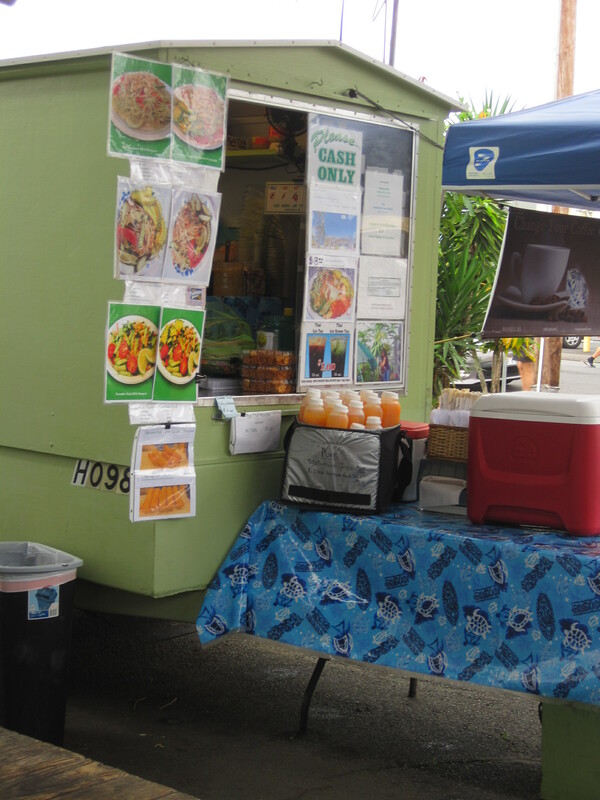 But, myMEGusta’s favorite was mixed to order by Rahana in her little truck at the Hilo market that day. Savored on a picnic table, with wafts of barbecue from a nearby stand floating by, it was the second best papaya breakfast ever. 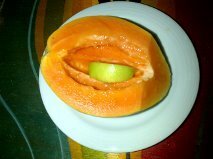 So true, a perfectly ripe papaya is hard to find in most supermarkets. The fruit is very delicate when ripe and will bruise easily. A careless thumb mark can spoil the fruit. 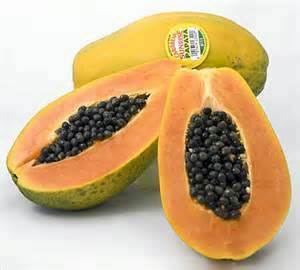 A ripe papaya has a very strong, unique flavor. So scour the ethnic markets if you want a good papaya, some will weight 5 lb. and more.